NOW: The cozy traffic in the “now” is exceptional. 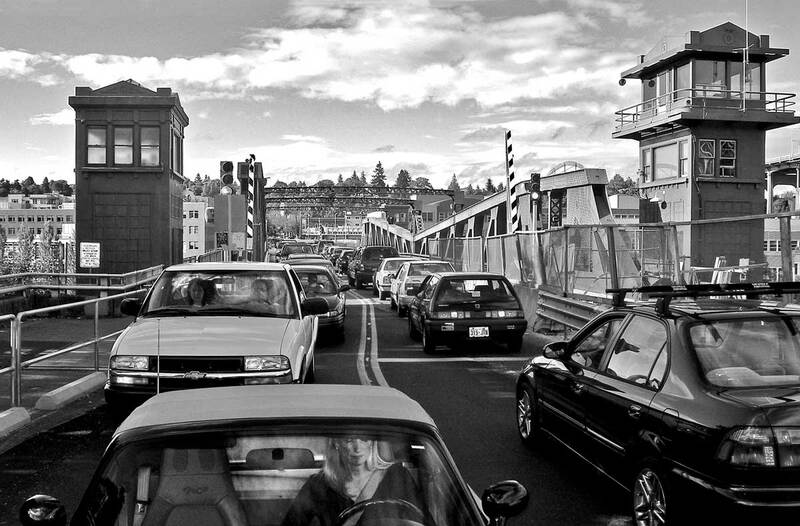 Although with about 35 openings each day the Fremont Bridge is one of the busiest bascules in the world it was also under repair when the “now” was taken in 2006 - the lanes reduced from four to two. Both views look north toward Fremont. Judging from the lean shadows it was about lunchtime when a photographer from the city’s department of streets recorded this look north towards Fremont and thru the new Fremont Bridge. 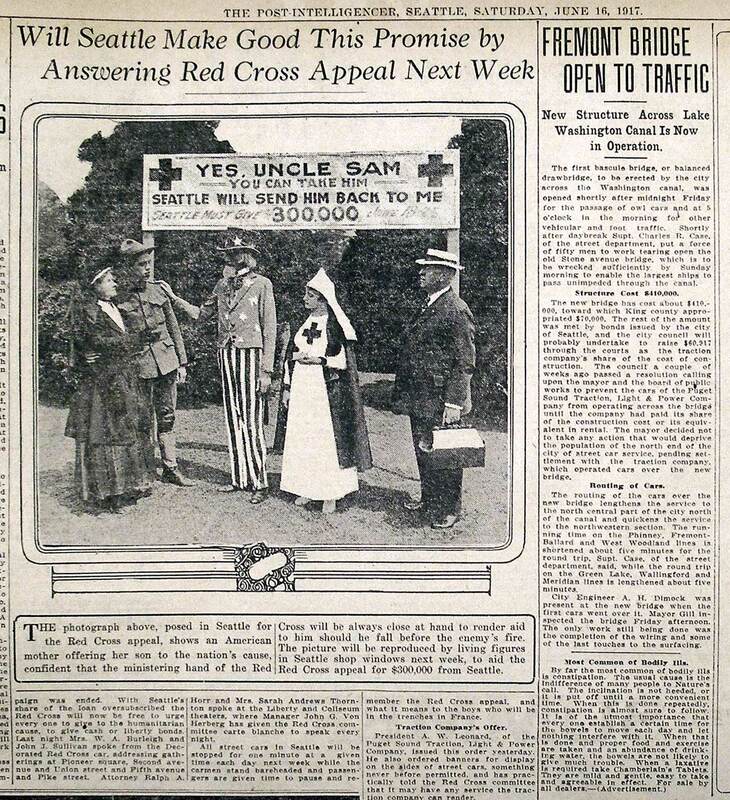 It may be the by now venerable draw bridge’s first portrait – formal or informal – for the beautiful bascule opened that day, June 15, 1917, at a little after midnight. At first it was only the “Owl Cars” or last street cars of the night that were permitted to cross the span, and City Engineer A.H. Dimock stayed up to catch the excitement in the wee morning hours of June 15. But later at five in the morning of its first day, a little after sunrise, the bridge was opened also to pedestrians and vehicles of all sorts. No doubt the drivers and riders of all those shown here – including the Seattle-Everett Interurban car – understood the significance of this day’s passage. Mayor Hi Gill also showed up in the afternoon for a little ceremony. At a construction price of about $400,000 the bridge cost only a hundred thousand more than the Red Cross kitty, which was promoted as needed for “ministering” to the potential frontline needs of Seattle recruits. Readers interested in the bridge repair may learn more about it and the Fremont Bridge on-line here.